WTI crude prices have fallen to the $44.50/b-$44.75/b range this morning, following another sharp collapse yesterday. WTI opened at $44.69/b today, a steep drop of $1.25, or 2.72%, below yesterday’s opening price. Current prices are $44.58/b, down by $0.15 from yesterday’s closing price. Diesel opened at $1.410/gallon this morning. This was a significant drop of 3.12 cents (2.16%) below yesterday’s opening price. Current prices are $1.4097/gallon, down slightly by 0.05 cents from yesterday’s closing price. Gasoline opened at $1.432/gallon today, a sharp drop of 5.36 cents, or 3.61%, from yesterday’s opening. Prices are $1.4186/gallon currently, down by another 1.41 cents from yesterday’s close. 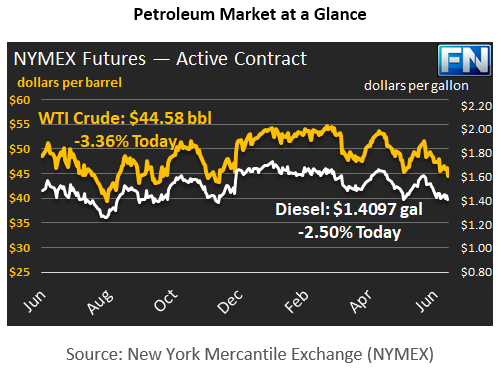 The price slump is reminiscent of last week’s downward correction, which also came on the heels of the Energy Information Administration’s (EIA) release of weekly supply data. Last week, the EIA reported across-the-board additions to stockpiles, plus weak apparent demand. This sent prices spiraling down. This week, market expectations concerning stock movements have varied widely. The industry expected a crude stock drawdown of 2.25 mmbbls, the API reported a stock build of 2.75 mmbbls, and the official EIA data reported a stock draw of 1.661 mmbbls. The EIA also reported another stock build of 2.096 mmbbls of gasoline and 0.328 mmbbls of diesel. Despite the crude stock draw, these were more bearish results than projected by the API. The weekly supply data also noted a drop of 48 kbpd in apparent demand for gasoline, falling from 9,317 kbpd during the week ended June 2nd to 9,269 kbpd during the week ended June 9th. Taken by itself, this decline would be fairly minor. However, last week’s supply data reported a drop of 505 kbpd. Therefore, apparent demand for gasoline for the first two weeks of June averaged 9,232 kbpd, versus an average of 9,596.5 kbpd during the four weeks of May—a drop of over 303 kbpd. We have noted that the weekly data may vary considerably from the finalized monthly data, which is published by the EIA with a two-month delay. In terms of total refined product demand, last week brought a bounce-back of 174 kbpd. However, the second successive week of apparent declines in gasoline demand is worrisome to fuel providers. Gasoline demand in June is almost always higher than it is in May, so it is below the norm this year. For purposes of comparison, U.S. gasoline demand was 9436 kbpd in May 2016, and it rose to 9,663 kbpd in June 2016, an increase of 227 kbpd. According to the data published by the EIA, gasoline demand in June exceeded gasoline demand in May each year since 2008. The year 2008 could be viewed as an anomalous year because of the summer of 2008 price spike and the collapse of the U.S. economy into recession. Gasoline is the premier fuel in the U.S. Consumers are sensitive to its price, and it plays a large role in refiner profitability. The EIA has analyzed how increased octane requirements are widening the price differential between premium grades and regular grades. The increased availability of light tight oils (LTOs) from shale plays is cited as one reason, since these feedstocks are not as well-suited for gasoline production. The EIA’s analysis follows as our second article.